This class goes over some of the basic techniques and ideas from Capo Ferro’s work including attacking in defense, tempo and measure, and basic form. The handout also contains some advice for those who are looking into exploring the text in depth including what to expect from the various sections of the text and some alternative ways to look at the plates. 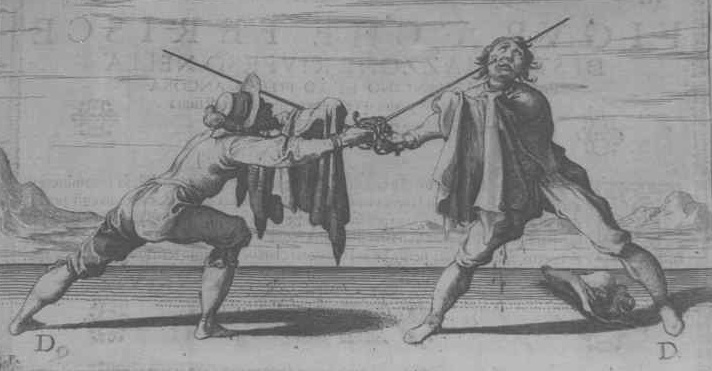 Categories: Fencing Technique, Instructional Articles | Tags: Capo Ferro, Classes, Deigo, Historical, Instructional Articles | Permalink. This class handout presents the perspectives of historical texts, modern sports psychology, the science of perceptual motor learning, and observations from successful fighters in the SCA. If you’ve been practicing for a long time, and can’t quite break through to the next level, or to the next round in tournament, it may be your head that’s holding you back. This handout, and the class it was written for, will provide you with vocabulary and tools to look at how your brain is helping or hurting your fight, and how to train it alongside your body. There is a long list of ideas to help you make your practice time more effective, enabling you to advance the application of your Art in whatever way inspires you. The Fighting Headspace Questionaire will help you look at your tournament head-space as well. After answering honestly, if you find an answer you don’t like, it’s worth looking at ways to reframe that part of how you approach your game. While coming primarily from a rapier fighter’s perspective, this handout is applicable to any martial art or life activity you pursue. Lady Mora is incredibly happy to spend time with individual fighters looking at how their brains are operating in their fight and looking for potential opportunities to improve. Please don’t hesitate to seek her out, at an event or electronically. Categories: Fencing Technique, Instructional Articles | Tags: Classes, Headspace, Instructional Articles, Mora | Permalink. This class has been taught at a number of Events, including Practicum of the Sword and Talon-Crescent Festival. I created a video after a similar class taught at SoCal Swordfight 2013 (http://www.socalswordfight.com/), a non-SCA HEMA event as an addendum to the class. This is not an exact replication of the class that may have been taught, but is a great add on and reminder for the basic information from the class. Categories: Fencing Technique, Instructional Articles | Tags: Classes, German, Instructional Articles, Lot, Meyer | Permalink. Being able to utilize your sword and secondary in combination is the key to fighting effectively. If you have to spend time concentrating on using both hands simultaneously, you’ll react more slowly and have a harder time focusing on controlling the fight. Situating yourself in a posture, or guard, and being prepared with the most appropriate defense will speed up your decision-making and allow you to react quicker to your opponent’s actions. 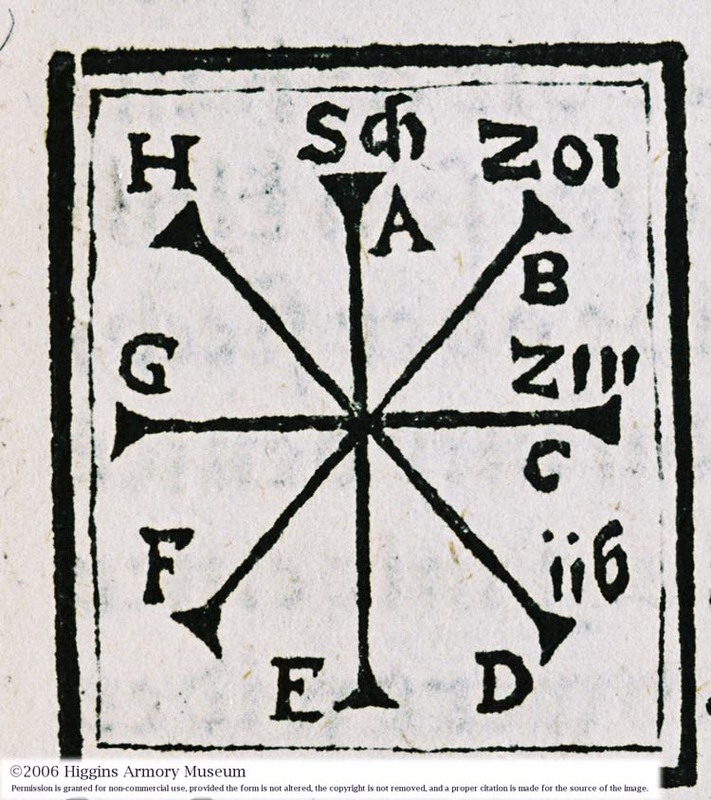 There are a multitude of systems that can help this process, but I find the easiest and most flexible to be the ones presented by the Italian Masters of the early 17th Century. 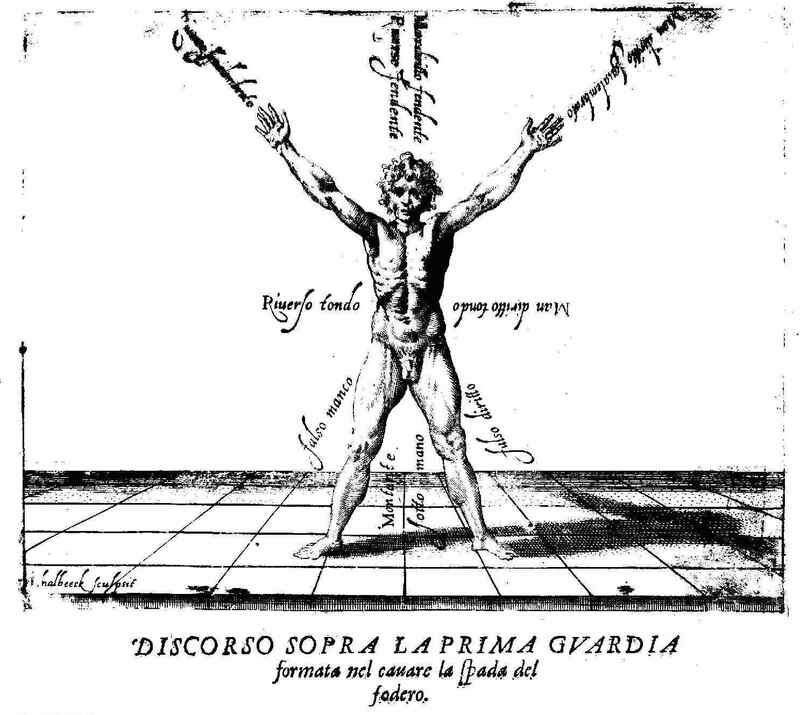 After distilling the works of Ridolfo Capo Ferro (1610), Nicoletto Giganti (1606), and Salvator Fabris (1606), we can find that all of these masters present a system that is fundamentally based on a quadrant defense. 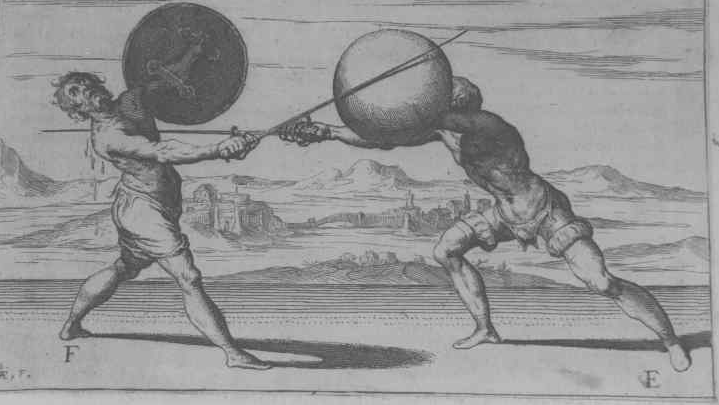 In these systems, more often than not, the secondary device (often a dagger) parries the incoming attack and a simultaneous counter attack occurs with the sword. The simultaneous action and reaction in this system allows for the secondary to be used primarily on defending the opponent’s attack and frees the sword to make the counter attack safely. The simultaneous attack and defense also cuts down the time the opponent has to react to your strike. In each case, the defense is enacted to close the line of attack with the secondary and support the action by counter attacking with the sword. We are not simply impeding the arriving attack, but pushing forwards to actively disrupt and deflect the incoming attack. Also, by pushing forwards instead of sideways, we do not open a space between the sword and the secondary that the opponent can take advantage of. Note in the examples below how the arms are portrayed moving forwards to defend the incoming attack. The general idea of this system is that by simplifying everything into one of four defensive actions, you short cut your decision making of ‘how do I defend this attack?’, and move quickly into defending yourself. Wherever your opponent’s point goes, you counter with a deflection from your secondary, putting your sword to an opening in their defense, usually just inside of their sword arm, and pushing forward with a counter attack. Set yourself in guard with your secondary shoulder loose and as extended as possible without straining or rotating your back hip forwards. Your partner approaches you in guard and aims their point where they see an opening, stopping just at the edge of their lunge distance. Determine which quadrant they are pointing at and prepare the appropriate defense with the secondary. Your partner attacks the opening with a lunge. You defend the attack with your secondary and extend your sword arm to where they are not defended. Note: the key to this action is that both hands move forwards together, one defending and the other attacking. Leaning forward with your torso (and not moving your feet) will also help. Repeat and practice defending against attacks to all 4 quadrants. If you find that your partner is attacking the same quadrants over and over again, and not attacking others, then you are probably covering the un-attacked quadrants in your guard. Try situating yourself in a different position that will create a new opening for your partner to attack. With practice you should find that you can easily respond to a predictable, straight-line attack, and can quickly assess where your opponent’s attack is directed. Also, you may find that if you situate yourself in specific postures, your opponent is more prone to attacking you in one spot more than another, making them more predictable and easier to counter. 1.Capo Ferro, Ridolfo. Scans of illustrations. Gran Simulacro della Arte e dell Uso della Scherma. 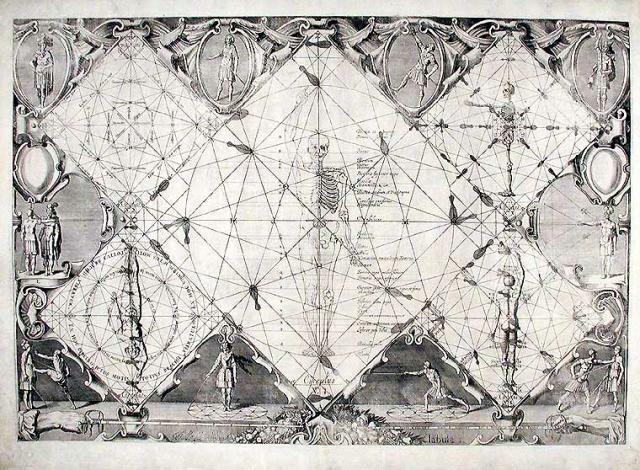 Siena, Italy, 1610. 2. 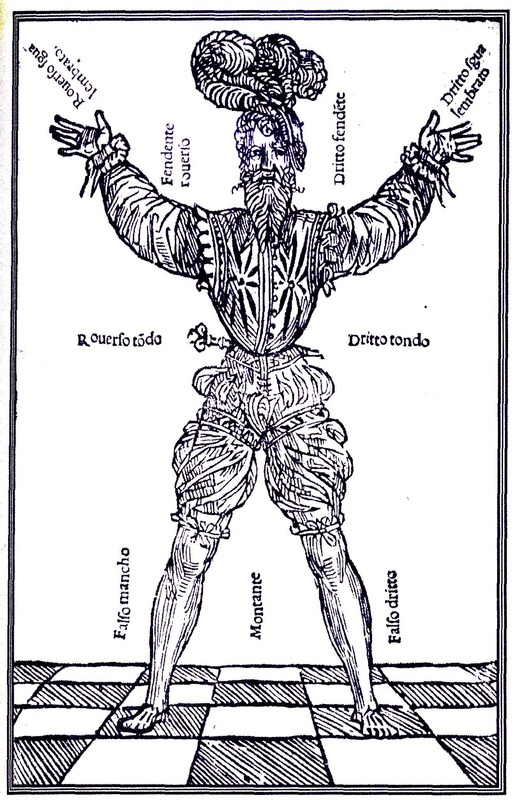 Giganti, Nicoletto. Scola, overo, Teatro : nelquale sono rappresentate diverse maniere, e modi di parare, e di ferire di spada sola, e di spada, e pugnale; dove ogni studioso portra essercitarsi e farsi prattico nella professione dell’ Armi. Herzog August Bibliothek. 2009. Categories: Fencing Technique, Instructional Articles | Tags: Instructional Articles, Secondaries | Permalink.